After spending 2017 adding ancillary services to their virtual machine-centric cloud, DigitalOcean kicked off 2018 with some product and pricing changes. Last year, DigitalOcean added support for firewalls, monitoring, load balancers, and object storage. Today's announcement highlights three new classes of servers, some with upgraded CPU, memory and storage. DigitalOcean touts itself as a public cloud for developers. They claim over a million users and their revenue is trending up. The company positions itself as the simple alternative to public clouds stuffed with services and prone to complex pricing schemes. 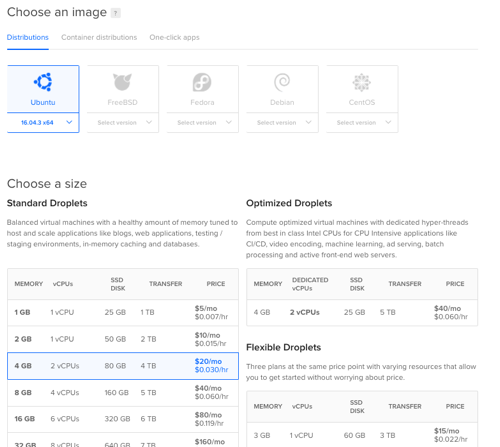 DigitalOcean's virtual machines—called droplets—now come in three plans: standard, flexible, and optimized. Standard droplets start at $5 per month and target basic apps. Flexible droplets cost $15 per month and offer three CPU and memory combos. Optimized droplets start at $40 per month and are meant for CPU-intensive workloads. The price wars in public cloud are fierce, but DigitalOcean maintains a competitive position. Comparing cloud offerings is a tricky game. But consider a single virtual machine with 2 vCPU, 4GB of RAM, 80GB of local SSD storage, and 3TB of consumed bandwidth. This costs you $0.03/hour on DigitalOcean and the $0.06 on Amazon Lightsail. An equivalent virtual machine in Microsoft Azure is closer to $0.07/hour. Pricing differences inevitably emerge as the virtual machine sizes change; you target different geographies, or append services like load balancers. InfoQ reached out to DigitalOcean's VP of Product, Shiven Ramji, to get more details about this announcement. InfoQ: What triggered this change in pricing structure? Shriven Ramji: We’ve always sought to provide the best price-to-performance and simplicity to our users. This new pricing is in direct response to the requests of our customers and it represents our continued commitment to their needs. As we have added more developers and businesses of all kinds to our platform, their needs have evolved too. The new plans are optimized to deliver what they need while keeping our pricing straightforward and simple. InfoQ: Do these upgraded compute options require new hardware in your data centers? Ramji: Yes, for some plans we’ve added new hardware. For example, the Optimized plans are built specifically for CPU intensive workloads, which perform better on a newer generation of hardware. InfoQ: Do customers see any change in their existing droplets, or do these plans only affect brand new droplets? Ramji: There will be no changes to existing Droplets. These are new plans and our customers will need to migrate to them to use them. InfoQ: Tell us more about the "flexible droplets." Does this let me pick the amount of CPU and memory for a given server? What makes them unique to DigitalOcean? Ramji: The flexible plans are in response to customers who want flexibility for the same price. We offer three different configurations for $15, making it easy for developers to select the configuration that best meets their needs. It also makes switching from one to the other very easy (if your needs change). InfoQ: Are these new high CPU hosts already all patched up to address Meltdown and Spectre vulnerabilities? Ramji: We are currently testing the patches that have been released by Intel and other vendors. Fleet wide reboots will take place following successful testing and validation. We will communicate the reboot schedule to customers in advance of any action. InfoQ: Are these new droplets available to all users, in all locations today? Is there any special registration required to get access? Ramji: These Droplets are available to all of our customers in all locations and data centers. No special access or registration is required. InfoQ: In the press release, you mention that per-second billing is on the way. What's the average lifespan of a DigitalOcean server? Are they typically short-lived and hence this adds immediate value, or are you looking to attract new, temporary workloads? Ramji: The average lifespan varies by Droplet type but for some plans we have seen 50-60% of the Droplet being used for less than an hour so this feature adds a lot of value to burst type workloads. We already have plenty of customers who use us for temporary workloads and we expect to add even more. InfoQ: Outside the United States, which geography is the fastest-growing for DigitalOcean. Thoughts on why that geography is taking off? Ramji: We continue to see tremendous growth in Asia, including countries like India and China. We are very active in the India market and have a local team that engages with developers and has served us very well. India also has a large developer population so the growth is not entirely surprising. InfoQ: DigitalOcean is still an all-Linux cloud. Any customer pressure to add Windows, or is Linux where your customers want you to stay? Ramji: We do get some requests for Windows services but the majority of the market is still using Linux. Our customer base reflects the market. We do not have any immediate plans for Windows support but may choose to provide this in the future. InfoQ: You've added a series of complementary infrastructure services (e.g. firewalls, load balancing, metrics) over the past year or so. As some cloud vendors shift their public attention to higher-level application services, do you feel pressure to do the same? Or do you see your focus on virtual machines as a sweet spot for you and your customers? Ramji: We are very focused on the developer experience and higher level application services / abstraction is an area where we get a lot of requests. For our customers, it’s not one or the other. We have demand for both types of computing and will continue to make our backbone more scalable, reliable, and performant while also bringing things like more features for our object storage solution, Spaces, container services, databases, integrations and enhanced security. In 2016 we were DigitalOcean customers and became aware of Linode which offered double the RAM for the same price effectively half the price for our hosting needs. We were happy with DO but I couldn't pass the option to literally cut costs by half. I contacted their support who were really nice but they wouldn't budge on pricing... We moved to Linode and were pretty happy with that. Anyway, it's great I can recommend DigitalOcean again as an option.